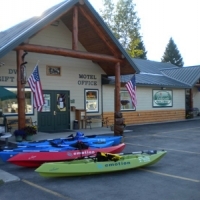 A short distance from the Cabinet Mountains Wilderness, Trout Creek is the huckleberry capital of Montana. Each year this charming community hosts its annual Huckleberry Festival, attracting visitors from around the region to celebrate the coveted purple berry. Trout Creek has accessible recreational opportunities, including camping, hiking, hunting and fishing. Also located nearby—beautiful Vermillion and Graves Creek falls. For a truly unique experience, plan to stay at The Shire of Montana.